In the autumn, leaves fall onto the ground, into the small ponds forming here and there, soon with brownish amber-coloured water. 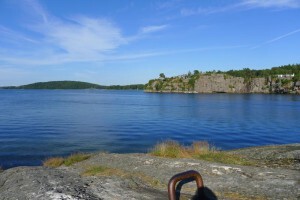 Resting for a moment on the surface, until a splash or a footstep causes it to cross the surface and sink towards the bottom, contributing to the forming colour. 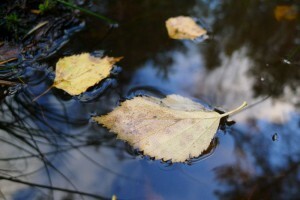 As the leaves break down, the oxygen in the water is consumed, and the humus acids tint the pond. 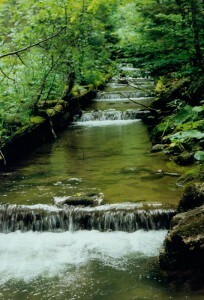 The water in the lower layers becomes reductive, oxygen deficit. 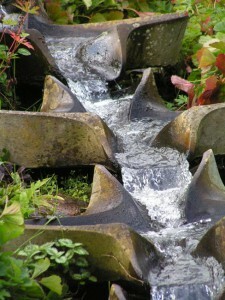 Slowly the water sinks down, and enters the groundwater cycle. Swish, swoosh, swish, swoosh, in a rhythmic pattern, the water swings to and fro in the vessel, a “flowform”, originally conceived by the British anthroposophist John Wilkes (1930-2011) in 1970 and since then developed into many shapes. Slowly, almost imperceptibly, the water level rises. Where are we actually heading? What is the attractor of our present course? Where will we be, when water finds its new level? The jet of water ejects out of the nozzle in a continuous, steady flow. Directing my eyes towards the opening, there is not a trace of pulsation. Yet just slightly above, the dance has begun. As the upward movement is gradually lost, the water jet starts to twist and bend, like a rubber band being pushed. 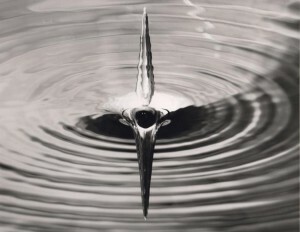 Water swirling in a bucket, with reflections of the sky in the water surface. A leaf is going with the flow. 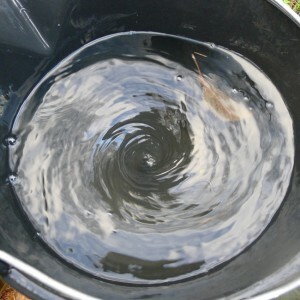 Round and round, the vortex swirls in the bucket, mixing whatever is in it. Perhaps one of our most mundane acquaintances with water is stirring it, although we seldom give the process a closer look. Stirring vigorously will only create a blur. 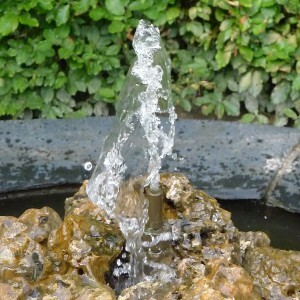 But the moment we leave water on its own for a while, the curved spiralling shapes appear and stabilize. The vortex funnel has chosen its preferred form. “The logs will not float even 50 meters”, was the official position of the Austrian timber commission. The experts had even brought a signed written testimony to the futility of the project. It was a timber floating system, conceived by the forester Viktor Schauberger, who was presently being employed as a timber transport consultant by the Austrian Government. 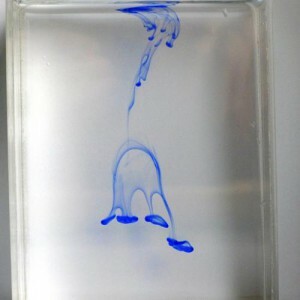 Water’s inherent tendency to form patterns can be observed as simple as with ink droplets falling into water (preferably in a container with flat walls). The impact of the droplet creates vaulting toroidal forms, vortexes resembling jellyfish, and finally, when the motion slows down, settles into sinking octopus-like forms. “Curved space”, 1991. Ripples and funnel forming in a very gentle vortex flow in a large egg-shaped container. As if they were carved out, the ripples in the water hover before my eyes. The gentle vortex flow pulls the water down, only to return it to the surface again, following the walls of the egg-shaped container. Round and round, the water seems to form a complete universe of its own. 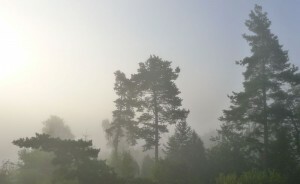 It is unavoidable to be affected by the stillness. 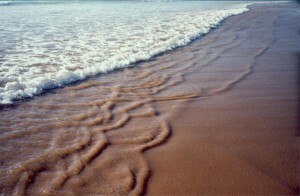 Self-organizing, seemingly out of nothing, the sand-water rolls appear. Where did they come from? The mo­ment before, when the incoming stream reached its highest level and turned, there was only a flat surface of murky water. Here on watercalendar.com you will be able to read more about the texts in Water Calendar 2013 – a journey into the Mysteries of Water. 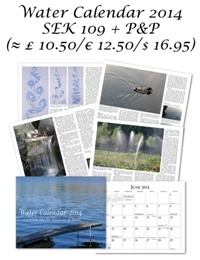 As a new month begins (starting on January 1:st, 2013), a new page opens for the month here at watercalendar.com, and by following the month’s link in the calendar you will find additional information and links related to the text.